Candied violet flowers are an elegant garnish on cakes, custards, ice cream, and other desserts. They look fancy but are incredibly easy to make (you'll only spend about 10 minutes in the kitchen; the rest of the time is just waiting for your crystallized flowers to dry). Violets (Viola species) grow wild in many parts of the world and in many gardens. You can also use pansies, which are in the same botanical genus. Just stick to the purple ones and avoid those with yellow hues. Pick up a violet flower by the stem. Dip the flower into the egg white, twirling it gently to coat the entire flower. Shake off excess egg white. If using a sifter, sift the powdered sugar over the flower. Twirl the flower stem between the thumb and forefinger of the hand that is holding it so that the flower gets evenly coated with sugar on all sides. Don't worry about candying the stem – you're going to discard it before you get to the finished product. Place the violet on a paper towel. Repeat the egg and sugar steps with the rest of the violet flowers. 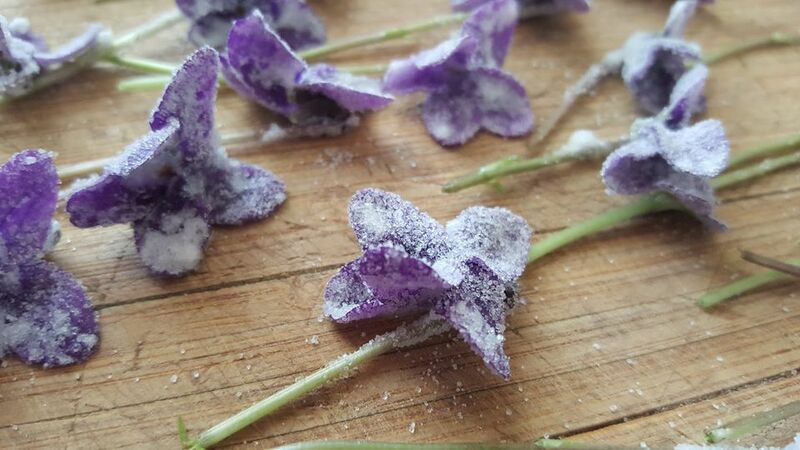 Transfer the sugared flowers, still on the paper towel, to a shelf in your refrigerator. Be sure none of the violets are touching. Leave them, uncovered, in the refrigerator for 24 hours. As the flowers dry most of the sugar will be absorbed by the egg white, creating a glaze on the petals. The next day, take the paper towel with the candied flowers on it out of the refrigerator. Let it sit out at room temperature in a warm part of your home for another 24 hours. Snip off the stems and discard them. Transfer the candied violets to an airtight container and store at room temperature. Use within 2 months. You can use this same process to candy other edible flowers. Note that it is the fact that the candied flowers are dried/dehydrated that safely preserves them (as much as it is the sugar).